Nick Quarm Dark Ambient Following the success of "As All Die", Clint Listing unleashes the second release of his new project on us. 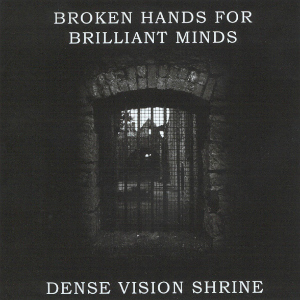 "Broken Hands for Brilliant Minds" has equally as much thrilling promise as any of his previous works, although this one should be somewhat calmer. Clint joins forces with Karsten Hamre's "Dense Vision Shrine" to bring us 8 tracks of gothic beauty. The album opens with "The Trial of Modern Faith", a beautiful piano intro, sombre loops, and very tragic whispered vocals. An Almost Neoclassical feel introduces us to the next track. Sorrowful Synth and basic percussion carry the ominous sounding "Jazz was made by the devil". The inlay to this split cd is a picture of a castle ruins in darkness. Nothing can really be added to this review to express the theme better. So forget that, the review is cancelled! Clint's genius ability to instill newer and darker visions in the mind of the listener shows absolutely no sign of slowing down at all. "Cut your Wings off to enter Heaven" is as much as an intriguing piece of music as the title is. Dark, very brooding, before becoming a gentile bastion of tranquility, before the moment is lost forever, and the brooding bass returns. The Ironically titled "At the End of the World" is the departing contribution for Broken Hands for Brilliant Minds defining release. Just scraping ten minutes, this grinding, bombastic number is a farewell (albeit only a temporary one) to a very unique, very promising sound; Strings, Horns, Percussion. Three words to conclude this half of the CD. To close out this release, Karsten Hamre (also of Arcane Art) starts his four-piece orchestral rebellion with the epically titled "Secret Kingdom". Minimal, Experimental, Dark. Like walking through aforementioned ruins, with a trebuchet firing in the distance, and war drums echoing underneath you. A theme of imprisonment weaves in and out of this cd, no track offers it more so than "Cast in Iron and Stone". Resonating, almost drone-like minimalism. Probably what it would sound like to listen to your heart resignating to the fact that the Iron shackles around your feet are there forever. This theme is only reinforced by "Dungeon Master". Very Similar sounding, but at times drops to a much quieter, almost tranquil escape, before the Iron Cell slams into its precipice, just inches in front of you. Probably one of the highlight's of the album. After unsuspectingly listening to this cd, finding myself taken prisoner after innocently entering the enemy's stronghold, and thenhaving the keys dangled in front of my face before being cruelly snatched away, I'm not sure the departing "Ark of the Seer"can really have any kind of effect on me. My ears certainly have accepted their torment. Yet with 11 minutes of this incarceration still to manifest itself, who knows what can happen? Perhaps someone will shove a file through the window. Or perhaps not. Instead, I get to listen to footsteps, above, below, outside, anywhere. It's too dark to see. Regardless, it doesn't matter, as ten minutes into this final act of barbarism, i get to listen to the door slam to an echoing halt one final time. That's it. Journey over. Sanity, check. Paranoia, check. Following the success of "As All Die", Clint Listing unleashes the second release of his new project on us. "Broken Hands for Brilliant Minds" has equally as much thrilling promise as any of his previous works, although this one should be somewhat calmer. Clint joins forces with Karsten Hamre's "Dense Vision Shrine" to bring us 8 tracks of gothic beauty. Truly Inspirational. Well done Clint, for a wonderfully successful contribution, and well done Karsten for a fantastic concept and soundscape. Both bands are definitely on the threshold to something much bigger. Their time starts here.